Zach Gould '10 adjusts the oscillator array installed on the roof of Rhodes Hall. 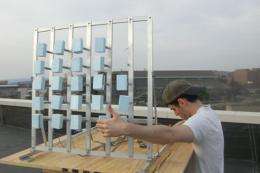 (PhysOrg.com) -- The Vibro-Wind Research Group is working on an efficient, low-cost method of converting vibrations from wind energy to electricity. A gusty day makes stop signs quiver and leaves flutter. It's these vibrations a Cornell research group is harnessing and transforming into electricity for a new kind of energy storage system. The Vibro-Wind Research Group, led by Frank Moon, the Joseph Ford Professor of Mechanical and Aerospace Engineering, is working on an efficient, low-cost method of converting vibrations from wind energy to electricity. Much the way solar panels now grace many rooftops, the researchers envision buildings outfitted with vibro-wind panels, which would store the energy they convert from even the gentlest of breezes. Traditional wind energy harvesting requires the use of large, expensive turbines, or windmills. The vibro-wind setup would require a fraction of the space and cost much less. "The thing with turbines and windmills is that you need wide open space, and you need it to be away from the city, because people don't like the way they look," explained Rona Banai '10, a chemical engineering major and chief student engineer of the Vibro-Wind group. Looking into the feasibility of vibro-wind panels isn't just about engineering. The group includes co-principal investigator Kevin Pratt, assistant professor of architecture, and architecture major Jamie Pelletier '10, who are working on design issues to address integration of panels into buildings. This past semester, the students -- exclusively undergraduates -- tested a prototype consisting of a panel mounted with oscillators they made out of pieces of foam. They set up their experiment on top of Rhodes Hall, hoped for windy days and monitored how much energy they captured with each quiver of the oscillators. The trickiest part -- the actual conversion from mechanical to electrical energy -- was done using a piezoelectric transducer, which is a device made of a ceramic or polymer that emits electrons when stressed. Banai in particular has also researched an alternative to the piezoelectric transducer, checking feasibility of using an electromagnetic coil instead. The pros and cons are some of the things she's now working to put into a report, she said. Vibration energy harvesting is nothing new, but according to Moon, interest in the subject has grown in the past few years in such areas as defense and civil infrastructure. The soldier of the future, for example, could shed the need for heavy batteries or other equipment, instead creating and storing electrical energy just by walking. Or civil engineers could rig buildings or bridges with sensors to detect fires and other instabilities, and the sensors would be powered by vibrational energy. "We are taking research that's been in progress, and we are trying to extend it into a new type of energy harvesting," Moon said. The study is funded by a $100,000 grant from the Cornell Center for a Sustainable Future's Academic Venture Fund. Co-principal investigators are: Ephrahim Garcia, associate professor; Hod Lipson, associate professor; Charles Williamson, professor; and Wolfgang Sachse, professor, all mechanical and aerospace engineering. What If Your Energy Supply is Gone with the Wind? Adding strips of kite fabric along powerlines, rooflines and light poles with similar systems could feasibly add some power to the grid, homes or power LED lights. If inexpensive enough, it could be fun thinking up uses. I think this is fantastic and hope that more light will be shed on these ideas! Harnessing energy through vibrations, we are limited by our imaginations and capability to gather vibrations, they come from nearly everything! The quartz crystal is used in radios to produce the piezoelectric effect. So maybe using a quartz crystal or other crystall to produce an oscilation and amplify that to transmit power to the end user?